It's nice to get down to the basics when creating simple cookies for holidays and celebrations. Often times if we're decorating sugar cookies with royal icing, our first instinct is to grab a piping bag or perhaps a squeeze bottle. One doesn't have to do this to make tasty cookies that are equally eye catching and wonderful. If you want to cut down on time spent making cookies everyone is going to devour in two or three bites, then search no further. With a few baking sheets, cooling racks, a small offset spatula, baked & cooled cut out cookies and some tinted royal icing, you can turn out a large amount of decorated cookies in no time. Save the cumbersome squeeze bottles and piping bags for those perfect cookies and baking projects that have to be picture perfect. For times when you just want simple goodness to hand out to guests or loved ones, make it quick, make it easy and keep it basic. Think backyard barbecues, family get togethers, bake sales or picnics on the beach or elsewhere. These are the types of cookies the little ones can help you with because there is no right or wrong way. It's a great project if you are going to keep them occupied while you tend to last minute decorations, tidying up around the house and getting the other items on your menu prepped and ready. 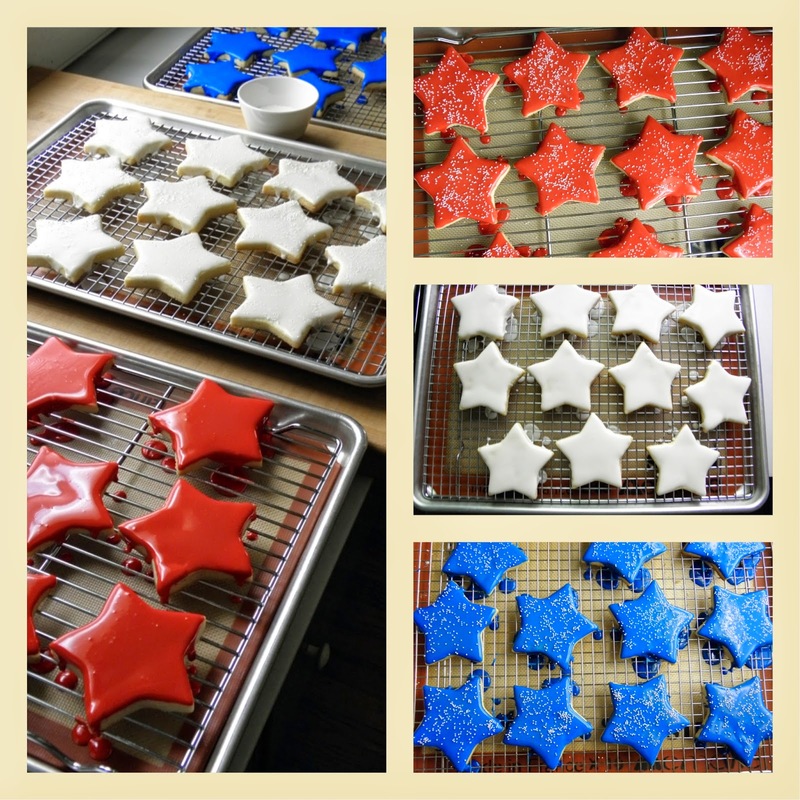 I find that stars decorated in our flag's colors of red, white and blue, can be made & enjoyed any time of year. 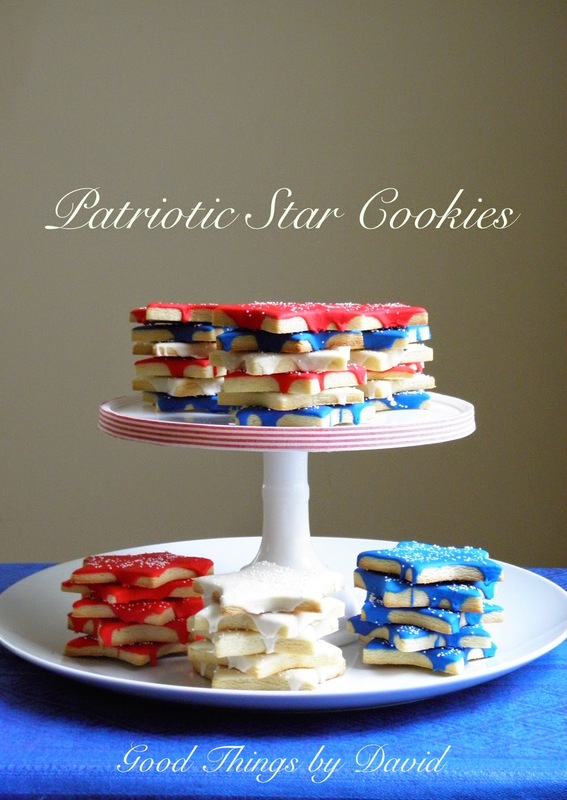 Let's get down to the basics with my Patriotic Star Cookies. You're going to love making them and your guests are going to love devouring them. 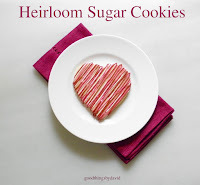 Begin by rolling out and cutting dozens of star cookies using my Heirloom Sugar Cookie Dough. For these stars I used the grated zest of two whole lemons to flavor them. That's one of the nice things about my cookie dough; a number of zests and/or extracts can be used to enhance the cookies. Notice that I didn't reach for fancy cookie cutters. I simply opened up my Ateco star cookie cutters made of tin and used the largest star. Once baked & cooled, I lined my baking sheets with silpats (you can use parchment) and placed cooling racks over them to hold the cookies. The royal icing was also a trusted favorite. I went to one of my Martha Stewart cookbooks and used her favorite icing, substituting meringue powder for fresh eggs and using lemon juice along with some water. Sifting confectioners sugar is a must! With a large spatula, I blended the liquid with the confectioners sugar and meringue powder until smooth. This didn't take long at all. Remember, I wanted to keep it simple. No mixer required! The icing was equally divided among 3 bowls. One bowl was left white and the other two were tinted red & blue. Ateco & Wilton gel pastes give a very good hue for this type of project. I trust both brands and highly recommend them. Note: you want your royal icing to be runny & drippy, as opposed to stiff. You can always thin it out with a few drops of water. Place a cookie over the cooling rack atop the baking sheet and gather the royal icing with a small offset spatula to spread it. Let it drip down the sides of the cookies wherever it wants to go. We want these cookies to look homey and scrumptious. Continue with the rest of the cookies in the same way. Set them aside while you continue to ice the rest of your batch. Give the cookies plenty of space so that they dry out as quickly as possible. The cookies can be left to dry as they are or you can greatly enhance them with some sprinkles, such as white or multicolored non pareils. Sanding sugars would work equally well here. Note: it is a good idea to gently move the cookies around with a small offset spatula, every 30 minutes or so, so that the cookies don't stick to the racks with the drippy icing. You're going to be tempted to pop a cookie or two in your mouth while you wait for them to dy. In order to avoid running out of cookies, make a couple of batches of them and some extra icing. You never know! Let's take a moment to slow down a bit from our busy lives and create some sweetness with a minimum of effort. By keeping things simple with these cookies and making them absolutely delicious, a weekend baking project doesn't need to turn into an ordeal. Remember the basics and keep it fun for everyone. 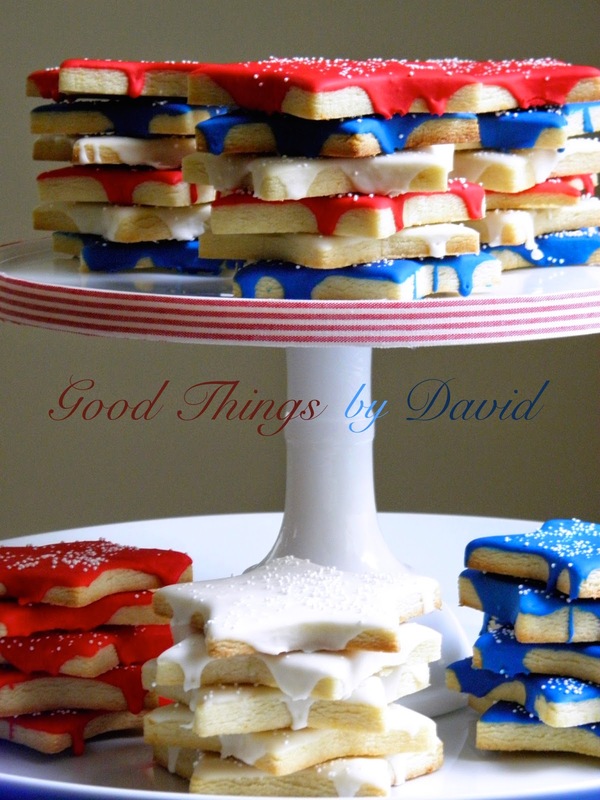 My hope is that many of you attempt to make a few patriotic cookies this summer that are as tasty as they are beautiful to look at. These couldn't be any easier or more tempting, David! I love the idea of just letting the icing run off the edges...yummy! 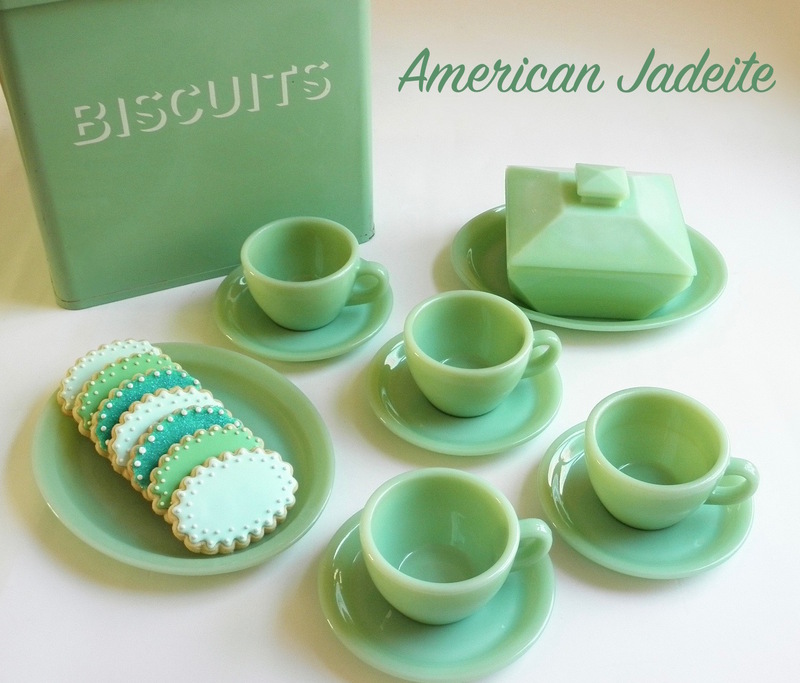 I'll have these on my 4 July table, for sure! Right now, I have chocolate and white cupcakes with vanilla bean buttercream in blue/white polka dotted papers resting on my red pedestal cake stand. I hope you're having a lovely weekend. Spring finally arrived in Iowa, and I'm loving it! Yes, Nancy, I wanted to keep these cookies as simple as possible. Do make them for your 4th of July table! I can't wait to see photos of your cupcakes! Best to you and your family. 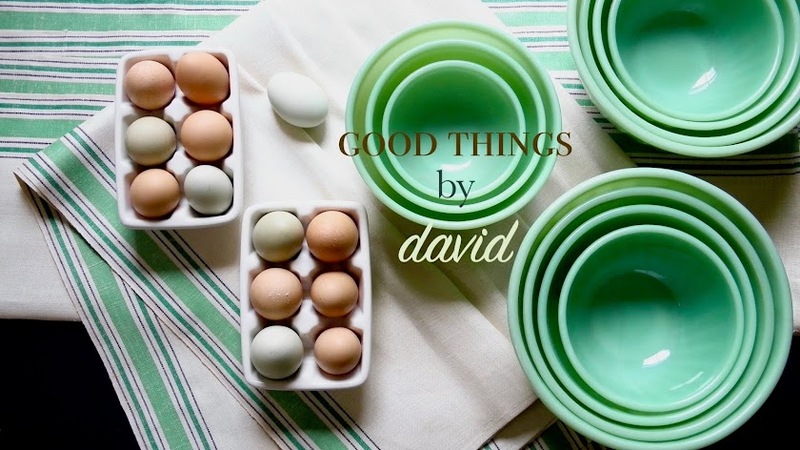 David: I just love the way you presented the cookies -- the dripping down the sides makes a great look! I will try this as well very soon. Thanks for the inspiration. I love the idea of a simple icing/decorating technique. As much as I love decorating cookies, sometimes you just have to keep it simple! Thank You!! I know we don't often think of keeping things simple, but sometimes it's just the thing to do. Excellent, I can't wait to see!